It is a well-known fact that pups have a much, much more evolved sense of smell than us humans do. Just so much of their brain is dedicated to processing the scents that they pick up on! But have you ever wondered just exactly how sensitive these pups are, and what they are capable of finding? 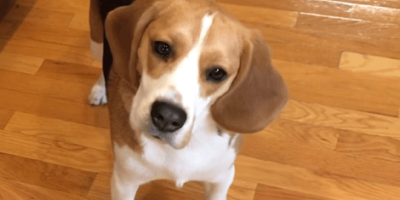 It is time to test things out with Oliver the Beagle pup. Hailing from a breed that was originally bred to hunt, Oliver is genetically one of the best pups you will want if you need to hunt down something by smell. Taking advantage of this, Dad decided to create a game that the family calls “smell-and-seek”! You may be asking, just what is this game? It is a game where Dad has hidden some treats around the house, and it is up to Oliver to hunt them down and sniff them out. Considering he gets to eat the treats he finds as a reward, he must love this game!